Découvrez Ketchikan lors d'une visite privée de 4 heures adaptée à vos intérêts. Faites votre choix parmi les principales destinations telles que Totem Bight Park, le sentier Ward Creek dans la forêt nationale de Tongass, la ville de Ketchikan, ou cherchez les ours noirs près du couvoir de Herring Cove. Comprend un guide privé et un véhicule, ainsi qu'une prise en charge et une dépose du port. Carol notre guide était très au courant de l’histoire de la ville nous avons pu voir l’échelle a saumon et ceux-ci en train de remonter le courant et avons eu la chance de voir une loutre. Carol était très au fait de la botanique et a accepté de rallonger notre itinéraire de balade dans la forêt. Il n’y avait pas de saumon dans le torrent donc pas d’ours mais la forêt en elle-même vaut le spectacle et la plage et la vue de la plage juste magnifiques. Nous avons choisi d’aller ensuite au parc à totem historique qui était très intéressant grâce à carol qui a pu nous expliquer en détail chaque signification de chaque totem, du mode de vie des natifs et des artistes qui restaurent les totems. Après l’excursion nous sommes allés nous promener nous mêmes dans la petite ville de Ketchikan qui est vraiment très jolie et nous avons pu y voir des lions de mer chassant les saumons. Une superbe journée qui avec beaucoup de chance est restée sans pluie. Our guide Carol was so informed on the history of all the places we went to and passed by in our car. Saw a bear and many bald eagles. We had a great mix of sites and a short hike through a campground to a beautiful beach. She even took us to shop for Pandora charms and to a brewery that had opened an hour before we got there for the first time. Had lots of fun. Great way to beat the crowds and have with the family. Ruth, our guide, was warm and welcoming and immediately checked with us about our interests and expectations. She provided a detailed and informative visit to Ketchikan. We saw a whale, a black bear, eagles, salmon and the totem park. The visit was at a relaxed pace, yet, covered all the important sights. Ruth had entertaining stories to go along with her tour. We came away feeling we had seen a little bit of both the historic as well as the current town. Would highly recommend hiring a guide and car to see the town. A local knows where to go and the sights are to far afield for walking. Our guide Carol was pleasant and very knowledgeable of the local area and would have gotten 4 or 5 stars. The folks in the office not so much. 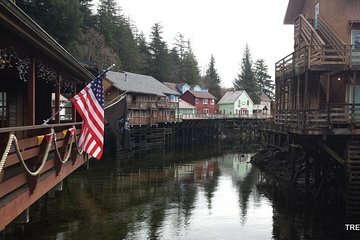 We had a very short day in Ketchikan. I had called a couple of weeks before our tour and spoke with Chris, one of the owners. My question was where do we meet our guide. He made light of the question, laughed and said that they would meet us in front of our ship with a sign that had our name on it. I typed his answer as he spoke, so I had a reference. On the day of our tour, we lost an hour of time because the other owner told the guide to meet us down the street at an other location. I had provided my cell number, should any concerns come up on the tour day. They did not call me, nor did they answer our calls to them. Carol, our guide, was very resourceful and ended up calling my office number which was forwarded. The mix up and just sitting on the dock was a waste of time we could have used walking around town. Being an experienced traveler booking tours around the world with no issues my 5 traveling partners found this disturbing and were trying to book last minute tours on the dock. We had booked a city tour and Carol was also not made aware of that and appeared perplexed. However, she improvised and adapted to our wishes just fine. We loved our tour with Karen. She was so comfortable to be with and gave us more than we expected. She was extremely accommodating and informative. We saw eagles, seals and lots of scenery. No salmon or bears as this was out of season. She gave us a full 4 hour tour despite our needing to delay our tour due to a later docking time. We would recommend her to our friends. All the best.